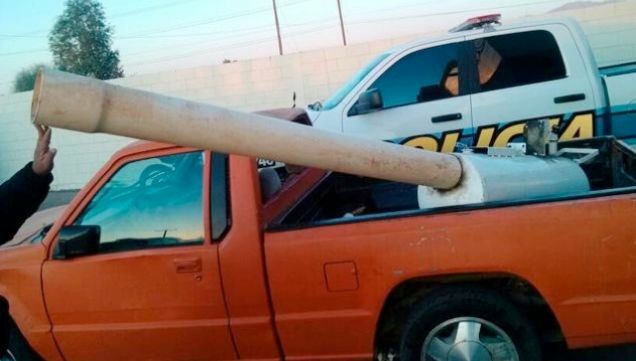 A crude but powerful homemade cannon consisting of a plastic pipe, a metal tank, and an old car engine, was confiscated by authorities in the Mexican border city of Mexicali last week. Police told Televisa they believe the device was used to launch packets of marijuana over the border fence into California. The so-called "marijuana cannon" was capable of hurling pot-packed cylinders weighing as much as 30 pounds, according to the police report. Over two dozen cans of marijuana were discovered by Customs and Border Protection agents near the Colorado River in Yuma, Arizona, in December of last year. Officials said a similar pneumatic-powered apparatus was used to fire the cans from about 500 feet away.